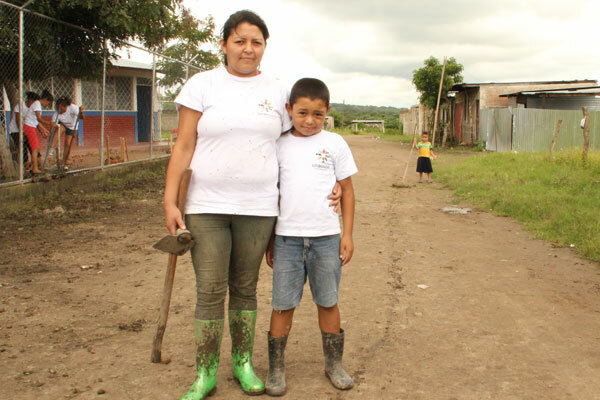 Sponsored child Everth and his mother, Carmen, participated in a neighborhood clean-up day organized by Unbound staff in Nicaragua. Along with other families they collected materials from the streets for recycling or proper disposal. The city of Estelí, Nicaragua, is a troubled one. Many families served by Unbound live in one of its neighborhoods that is unsafe and run-down. The neighborhood is underdeveloped. Its dirt roads run with raw sewage. A majority of the sponsored children attend a school on the main road in the neighborhood, an area that has a lot of garbage strewn about. But the community is trying to make small steps forward, and Unbound is helping residents work toward creating a safer and cleaner neighborhood. More than 200 sponsored friends and their families participated in a clean-up day hosted by Unbound. Unbound hosted the event to create a sense of community involvement and to raise awareness about the effects of environmental pollution. During the morning, sponsored friends and families cleaned up the area around the local school, collecting recyclable materials and properly disposing of the trash. In the afternoon, families split into teams and put their creativity into action. They turned recyclable items they collected in the morning into art. One group made a trash can from recycled plastic bottles and placed it near the school. Sponsor today and empower someone to make their community a better place to live.